Initially, I was not excited about this recipe from my great-grandmother’s collection. 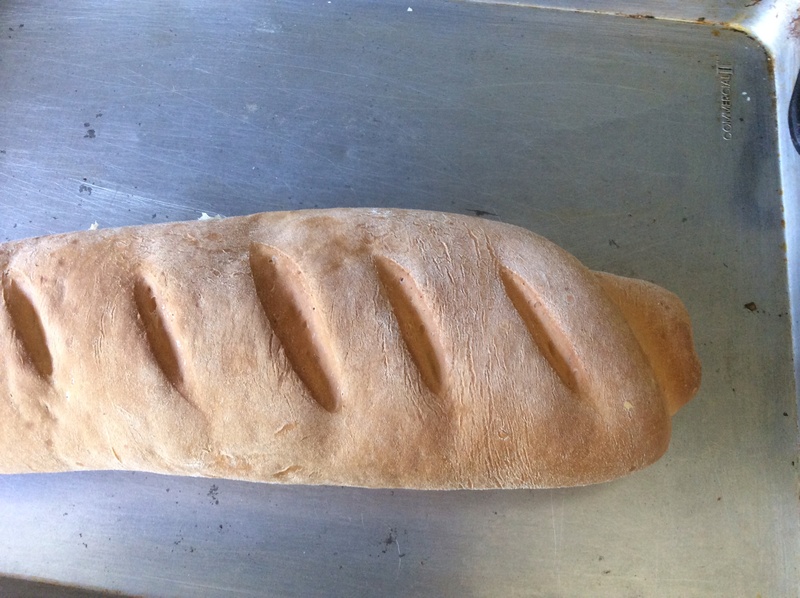 I have tried once, and failed, to make French bread before–loaves shaped like French bread that were extremely disappointing. I have also read through many French bread recipes that seems terribly complicated and required things I did not have (a lot of time and special pans). But, when I read through this recipe, it seems almost too simple. There must be some steps missing, or maybe this would not turn out at all. But, I decided to try it yesterday, on my day when I usually have time to bake. I say “usually” because I have not had time in the last month, as you can tell by the dearth of baking posts. This bread was amazing! 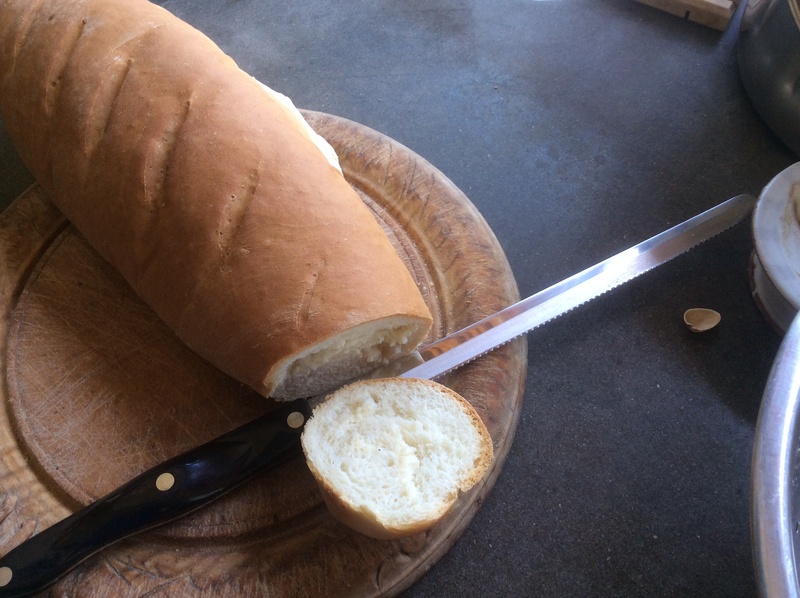 It was not the baguette with the hard crust and big holes inside. It was the bread that you make the best market (or sub) sandwiches from, with a chewy, crusty crust and a VERY soft, white middle. It was the bread that I’ve gotten from many bakeries in other countries – perfect for a piece of soft cheese or butter and jam or avocado and tomatoes. The flavor was wonderful too. I will definitely be making this bread again, and probably often, despite the very “white-ness” of it. Here is the recipe with my notes below. It is really pretty simple. Sprinkle yeast into ½ cup of water. Stir until dissolved. In a larger bowl dissolve sugar and salt in remaining c of water. Add shortening and yeast mixture, mix well. Add flour and mix well. Work through dough with spoon at 10 minute intervals for 5 consecutive times. 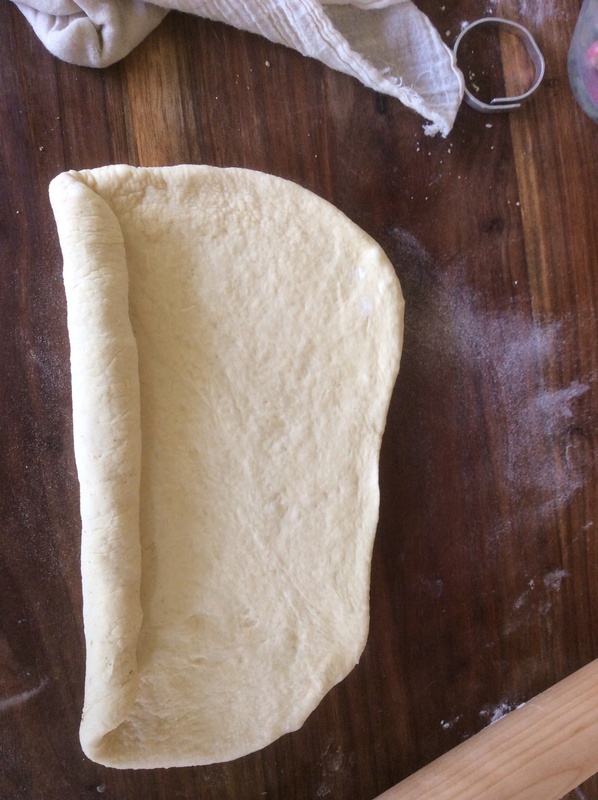 Turn dough onto lightly floured surface and divide in half. Shape into 2 balls. let rest 10 min. Roll each ball into a 12 x 9” rectangle, then roll as for Jelly roll from long side . Seal edge. 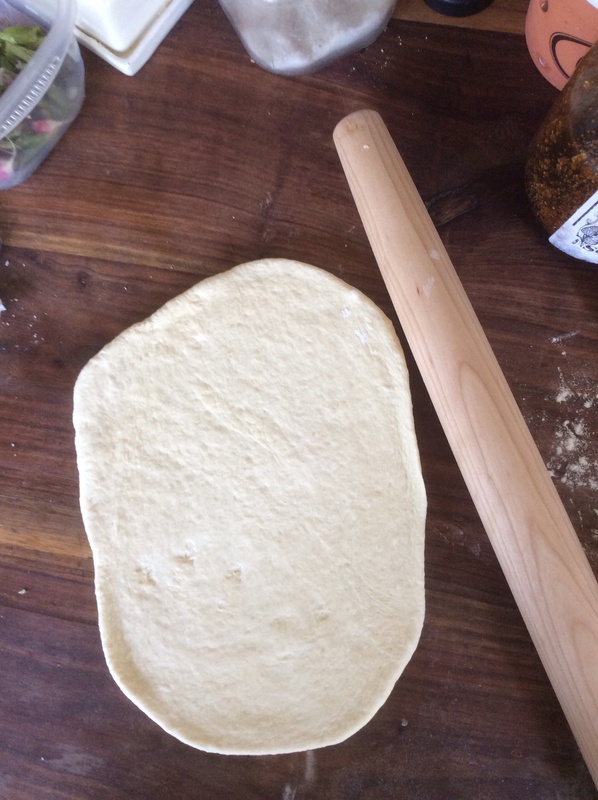 Place rolls on pan. Score top 6 times. Cover, let rise 1 ½ hours. Bake 400 degrees – 30 to 35 min. Brush with melted butter while warm. I did not sift the flour, but I did put it in a bowl and whisk it a few times before I measured it. I was a little slack about getting to the bread every 10 minutes because I was taking care of my little boys (reading books, pushing swings, changing clothes, etc. ), but every 10 to 15 (maybe even 20) minutes worked. 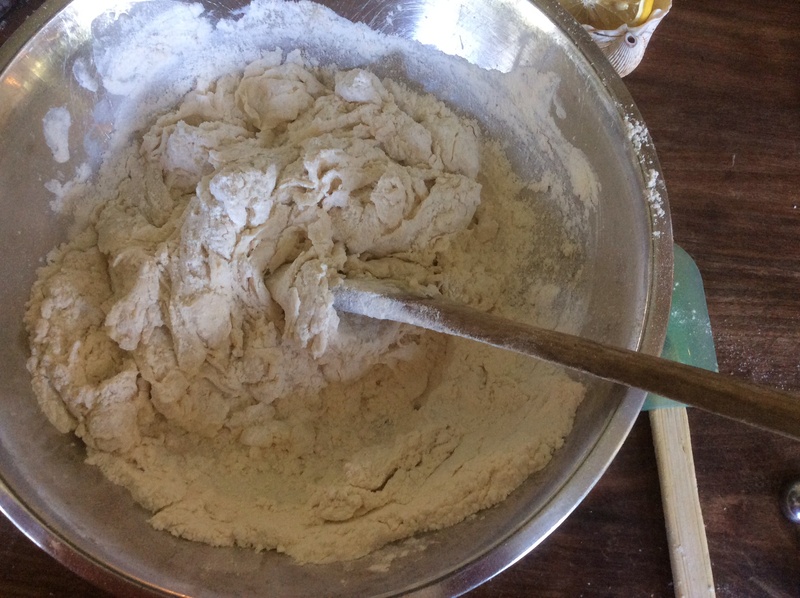 Also, I did not know how to “work through dough with a spoon” so I just kneaded it a few times in the bowl instead. I probably let my bread rise a little longer than 1.5 hours because we were down in the garden and I forgot about the bread for a little while. Finally, I did not brush with melted butter–it was still good.